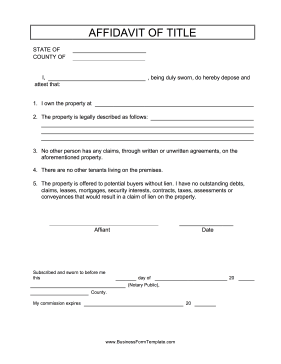 Homeowners who are trying to sell or transfer their property can give this free, printable affidavit of title to potential buyers. No other person has any claims, through written or unwritten agreements, on the aforementioned property. There are no other tenants living on the premises. The property is offered to potential buyers without lien. I have no outstanding debts, claims, leases, mortgages, security interests, contracts, taxes, assessments or conveyances that would result in a claim of lien on the property.